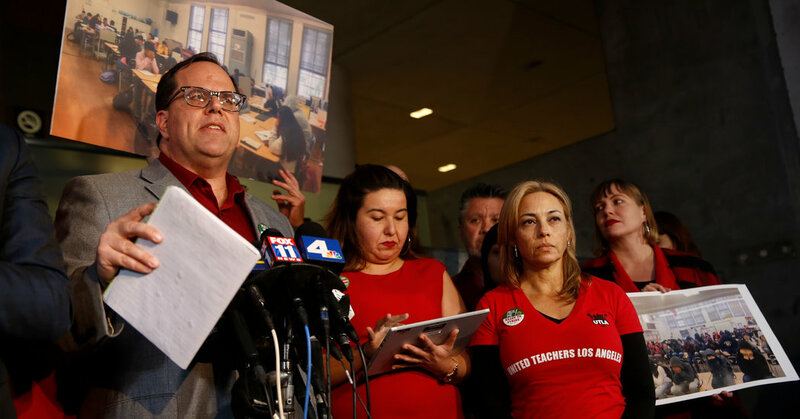 LOS ANGELES — More than 30,000 Los Angeles public-school teachers are expected to begin a long-planned strike on Monday, pressing demands for higher pay, smaller classes and more support staff in the schools. The strike will upend learning for roughly 500,000 students at 900 schools in the district, the second-largest in the nation. The schools will remain open, staffed by substitutes hired by the city, but many parents have said they will not send their children across picket lines. The impact of the walkout is likely to ripple across California and the rest of the country. Teachers mounted large-scale strikes in six other states last year to protest low pay and demand more money for public education. Already, teachers in Oakland, Calif., have threatened to strike over similar issues. “We have not received a proposal, and we will be striking tomorrow,” Arlene Inouye, the lead negotiator for the union, said Sunday evening. Union leaders have complained about large classes, which have grown to more than 40 students in some of the district’s middle and high schools, and have said the system needs many more nurses, counselors, librarians and other support staff as well as teachers. Although district officials have agreed to come closer to meeting some of the union’s demands, they say fulfilling all of them would bankrupt the system, which is already strained by rising health care and pension costs. District officials have tried for weeks to avert the strike, putting political and legal pressure on the union to stop teachers from walking off the job. Instead of encouraging a walkout, district officials argued, the union should direct its energy and its frustrations at the state government in Sacramento, which determines the district’s annual budget. While the union has portrayed the strike as a strategy to get students what they need, district officials say it will hurt the most vulnerable schools and students. The strike’s effects will be felt differently throughout the sprawling district, which has pockets of wealth but a great majority of students who come from low-income families. Although many parents have said they will keep their children out during the strike, others say they have little choice but to send their children to school, even though there is a good chance they will sit in an auditorium all day, supervised by substitutes. In some neighborhoods, parents have been organizing co-ops of sorts, with plans to take shifts caring for or even teaching small groups of children in homes during the walkout. Some employers have given workers permission to work from home during the strike. But many parents who work low-wage jobs without paid time off cannot afford to take part in such plans, and for them the challenges posed by the strike are formidable. Los Angeles is opening dozens of community centers where parents will be allowed to leave their children during school hours, free of charge.